Sae Taw Win II Dhamma Center would like to announce. It is with great honor and excitement that I announce our Center is about to build the replica of Shwedagon, the holiest shrine of Burma. 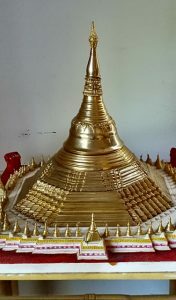 Stupa building in our Samantha tradition is not only for donors to acquire merit but it is to create a powerful vortex of spiritual energy of healing. The Stupa will be built in the circle within the circular driveway in front of the Dhamma House. It will be 19 1/2 ft in height and about 22 ft diameter at its base. It will have 6 small companion stupas surrounding it as well as the 8 astrological corners that will represent the days of the week. We will be breaking ground ( Panet Cha Pwe ceremony ) on May 31 morning. We are happy to invite you to participate at this auspicious occasion. We plan to begin constructions as soon as we have completed the ground breaking ceremony and hence the Center is now accepting donations so that we can begin building the platform right away. It is estimated to be around $100,000. Or your funds can be sent through PayPal on our website. Whether you send a check or through Pay Pal please designate your dana as Shwedagon Zedi Fund. We are. Non-profit religious organization and your donation is tax exempt. Please include your mailing address or email so we can send your tax exempt letter when we receive your contribution. Architectural details will be forthcoming soon. May you be peaceful may you be free from strife. Dr Thynn Thynn and Board of Directors of Sae Taw Win II Dhamma Foundation.